This evening I stayed out in the garden after the sun went down, with a crescent moon above. I was warm enough in the chilly weather with a cozy jacket, hat, and work gloves on; motivated to keep working with the knowledge that winter is fast approaching and that clearing needs to be done. Clearing involves pulling up plants and cutting them up for the compost bin; taking down the trellis and bamboo poles; emptying soil from containers, and so on. I enjoyed being outdoors tonight. The temperature was nice and cool for working and there were no pesky mosquitoes. I was listening to music on my iPhone as I worked. A purist might wonder why I didn’t tune in to the sounds of nature, but it was a quiet night and my 21st century soul needed/wanted some music. I decided to write a haiku for Ronovan’s Weekly Challenge, based on this evening’s activity, and stopped putting things away in the garage to type a few ideas into a notes app. The prompt words that I had to keep in mind are “Cheer” and “Call”. 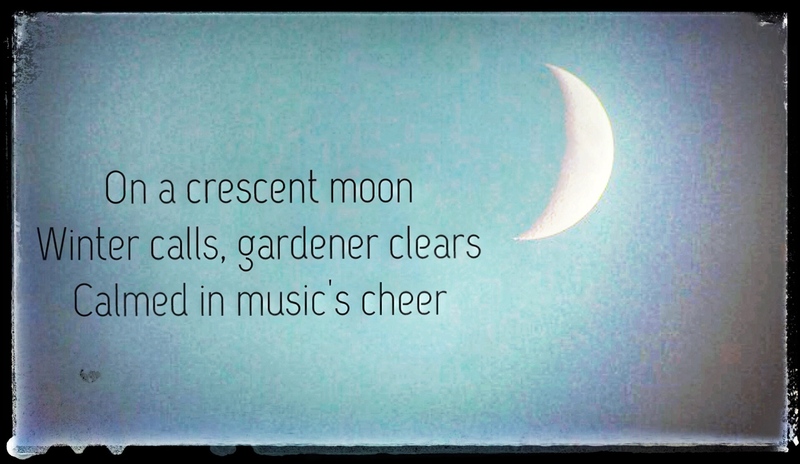 Winter calls, gardener clears, calmed in music’s cheer.